A metal crosslinked finish designed for high speed buffing and exhibiting a nice gloss. An extremely durable, high gloss finish which gives a brilliant initial gloss and can be either buffed or burnished. For quick efficient low cost floor stripper that dissolves WAXES, FINISHES, POLYMER BUILD UP. A concentrate and dual purpose floor treatment made to be mixed with water and mopped on like a cleaner. Dries dull and can be buffed for a brilliant shine. Designed to be one of the quickest mop on strippers that completely lifts and dissolves the toughest of floor finishes. An acrylic polymer designed specifically for use as a seal for resilient floors and concrete. 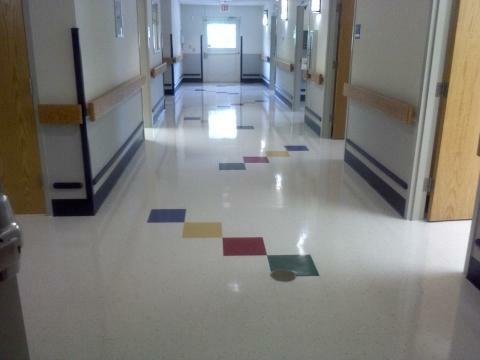 Multi purpose product which works well with a high speed floor maintenance program. After pre-cleaning floor, mop restorer on floor area, let dry, then floor may be buffed with high speed machine. Achieves a brilliant (wet look) gloss by cleaning the surface and preparing it for buffing. This high power, highly concentrated, NEW GENERATION stripper liquifies the toughest of floor finishes fast and easy. Allows you to strip your floors and be ready to recoat in as little as one-third of the time required for ordinary strippers. Reduces labor costs while cleaning and polishing in one step. Apply by using a spray bottle and applying product over small areas and then buffing.